The True Heritage Brew Singapore Sling® Original Mix is an exotic infusion that teams traditional techniques with the latest technology to produce a distinctive concoction. Containing gin, grenadine syrup, Angostura Bitters, cherry brandy, Cointreau and Bénédictine, the exquisite blend weaves a spectrum of various distinctive and subtle flavours into a cohesive mix. As an iconic drink of Singapore, the Original Mix is most reflective of the fine tapestry of the multi-racial, multi-cultural country, where four main ethnic groups of Chinese, Malays Indians, and Eurasians numbering more than five million people live together in harmony to create one common identity. Like Singaporeans, the signature essence of the Original Mix is robust and versatile. This quality makes it ideal to create extraordinary, luscious cocktails. 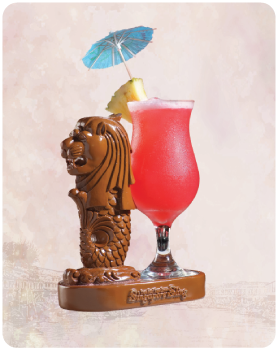 The True Heritage Brew Original Singapore Sling®, which is blended with fresh pineapple juice, is one fine example. The THB Singapore Sling® recipes presented here are just stones to lead the way, for you to experience the versatility of the THB Singapore Sling® Original Mix. Add creativity and enthusiasm, and you will have endless fun creating your own special Sling concoctions. You are most welcome to share your unique recipes by email to us. If selected, the blend will be named after the name that the creator chooses. You will also receive a memento for your participation. Preparing Cocktails With The True Heritage Brew Singapore Sling® Original Mix Is Simple And Fun. There Is No Rocket Science To It. All You Have To Do Is Follow The Steps, And 'Sling' To Produce A Mouth Watering, Sensual Mix! According to the International Bartenders Association (IBA), cocktails are served in specific glasses but what we suggest you do here is have fun: if you don’t have a Collins glass for a Singapore Sling, be creative, use something else! Let the original alluring taste of True Heritage Brew Singapore Sling® bring you back through history to the roaring 1900s. Fresh Pineapple Wedge & Umbrella Cocktail Pick. Pour all the ingredients into the cocktail shaker. Shake vigorously for 10 seconds. Strain into the glass. 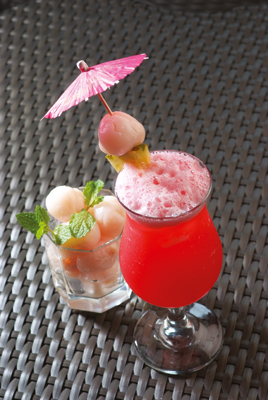 Enjoy this THB Singapore Sling® bursting with the refreshing and juicy sweetness of the exotic fruit - the Lychee. Canned or Fresh Lychee, peeled & seeded. Pour all the ingredients into the cocktail shaker. Shake vigorously for 10 seconds. Strain into the glass & add the garnish. 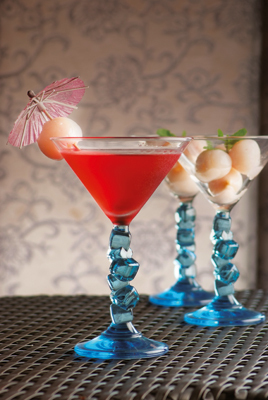 Vary the Lychee Sling with the Martini. You will swiftly fall in love with its sweet and fruity fragrance. 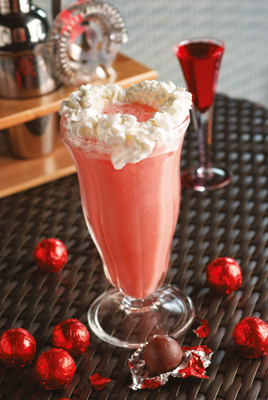 This delicious Sling version surely combines the best of both worlds for chocolate lovers! Pineapple Wedge or Cherry on a cocktail pick. Pour all ingredients into the cocktail shaker. Shake vigorously for about 10 seconds. Strain into the glass. Complete with garnish. Add a touch of elegance and style to the Chocolate Sling and indulge in its rich, luxurious chocolate smoothness. Need we say more? Pour all ingredients into the cocktail shaker. Shake well for about 10 seconds. Strain into the glass. Enhance the popular traditional Russian Berry drink, Mors, with this variation of THB Singapore Sling® Original Mix, Vodka and three colorful and cheerful berries. 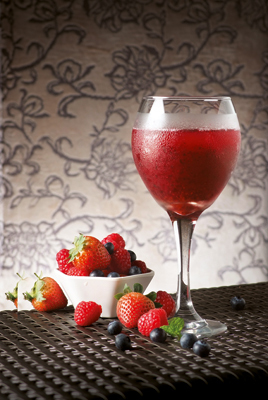 A berry delightful Sling cocktail! Blackberries, Blueberries & Red Berries on a cocktail pick. Crush the berries for juice. Strain the juice and pour it with the other ingredients into the shaker. Shake well and serve in the glass with garnish. With the added goodness of vitamin C, this Sling could top the rank as the 'healthiest' Sling of all! Orange slices of half moons, about 6mm thick. Pour all ingredients into shaker. Shake well for about 10 seconds. Strain into glass and add garnish. 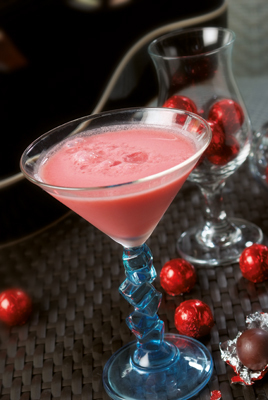 Learn more exclusive recipes and tips in our cocktail recipe booklet! 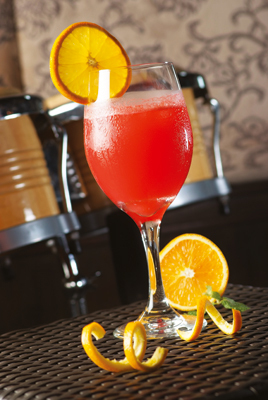 Download the entire THB Singapore Sling® cocktail recipes here.